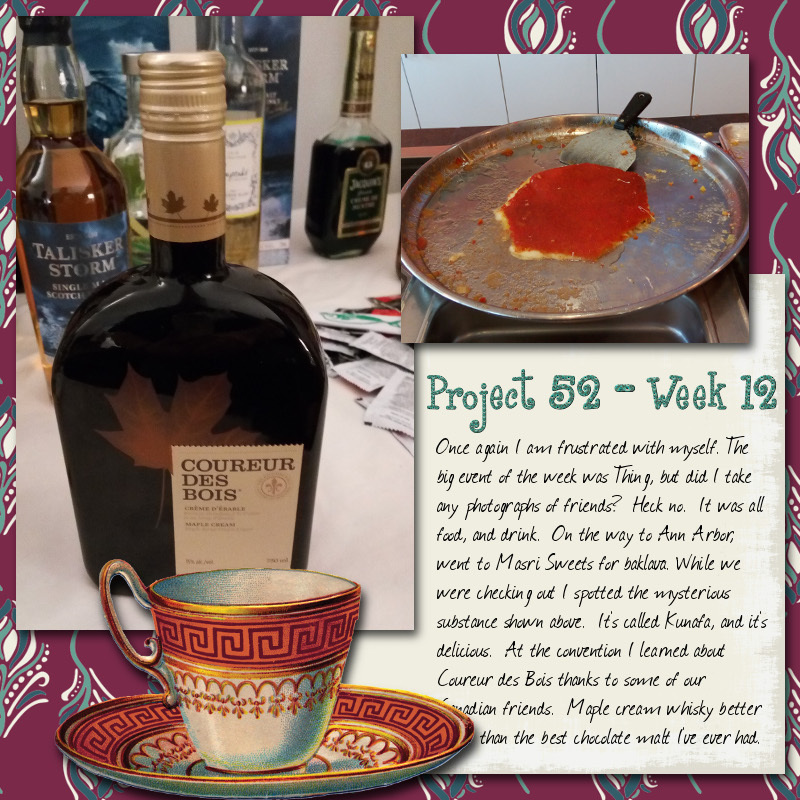 I wanted to mention that the scrapbook image seems to be from the first week of your project; I don't know if that's intentional or not, as you mentioned you didn't have many photos of the weekend, but I thought I'd mention it just in case. Oh crap, that was a cut-and-paste failure. I changed two of the three 01s to 12s if that makes any sense. I really need to make an effort to get more sleep. I make dumb errors when I'm not sleeping enough. On an entirely different note, is that the lovely Diana Rigg in your icon? That is Essie Davis, who plays Phryne Fisher in Miss Fisher's Murder Mysteries, which is a thoroughly delightful Australian mystery show. Now that you say it, though, I can definitely see the resemblance. I wondered that. Miss Fisher's MM is on my list of things I want to see. Yeah, it'd have been good see you there. I was thinking about you when the bunch of us trekked over to Artisan too. At least your reason for missing Thing was less traumatic than Bob & Connie's. You heard Amanda was in an auto accident and was hospitalized overnight, right? I still haven't heard details other than she had no memory of the crash. Head trauma will do that, so I wasn't entirely surprised, especially since I think I also heard her airbag failed to deploy. Just saw a thing in the paper about car recalls (due to bad airbag deploy systems) that are not being followed up on by the cars' owners. yeah, I saw Connie's posts when I logged in to FB to contact my sister (who was also travelling and not checking her email). I'm still waiting for my car to come up in the recall -- I got a letter saying they'd let me know when they had parts, but until then.... OTOH, the car is one of those "we don't think we were actually using those components on that assembly line when that car was built, but it's possible, so we'll check. But not until we have replacement parts on hand." Apparently if you stick your VIN into the form on https://www.nhtsa.gov/recalls it will tell you whether or not you have on the faulty airbags (or other unfixed problems). We should do this with your van, seeing as we have no idea if it was ever subjected to a recall or if it was if it was fixed. Maple Cream Whiskey sounds fabulous! It was **so** good. I wanted a red solo cup's worth of the stuff but all I got was about a half inch. Just as well, there were many people interested in trying it and it's hard to come by. Jebra told me the only place you can find it for sale is in Montreal Canada.